2019 RATES are now posted in USD currency, except for "Ontario Resident rates). 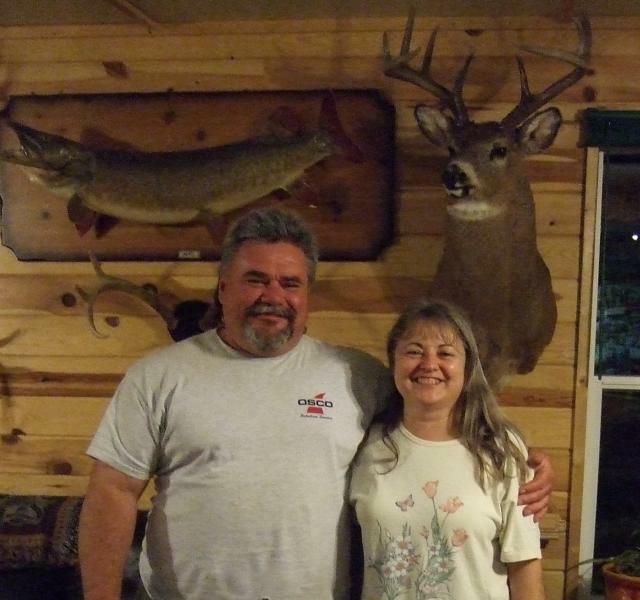 Enjoy your vacations at our drive-in lakeshore lodge with modern lakeview cabins, lakeside RV sites, excellent Fishing, incredible Hunting, outstanding Bird Watching, beautiful sunsets, bountiful wildlife, sightseeing adventures. The photo opportunities, outdoor and ecotourism adventures are memories to last a lifetime! We are secluded but not isolated - which makes it peaceful, but you are not isolated - which makes all amenities available for your enjoyment. Harris Hill Resort might possibly be the Best Kept Secret of Lake of the Woods for many reasons, with its Excellent Fishing, Incredible Hunting, Modern Cabins and Deluxe Boats. HHR is one of the premier trophy fishing lodges, family vacation resorts, and hunting outfitters on Lake of the Woods and more specifically on the Southern end of Lake of the Woods in the Rainy River district of Northwestern Ontario. 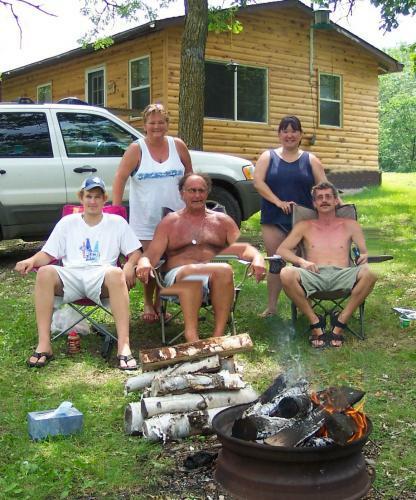 We are a drive-to 3 season Resort, only 18 miles from the American / Canadian border of Baudette MN and Rainy River ON. We are the only Resort between Rainy River and Morson Ontario in a low population area that offers uncompromised fishing and hunting in the area. We are only 17-18 miles from hospitals, shopping and amenities on both the Canada and USA sides. Since the lodge was first built in 1960, very many upgrades and renovations have been done to provide you with the comforts of your own home. WiFi is available at Lodge now, should be throughout Resort for 2019, and also Cell phone use depending on your carrier. It seems like you can almost always pick up a USA Tower when on the Lake or in your Hunting Stand. We offer both American Plan and housekeeping packages, as well as professional hunting and fishing guides, bait, tackle & License sales. We have all the equipment and amenities for a fun-filled and adventurous vacation. DRIVE-TO 3 Season Resort on Lake of the Woods Ontario Canada. EASY ACCESS - Direct Route - all “Highway” Pavement until last mile with well maintained hard packed Gravel. Only 18 Miles from 24 hr International Border Crossing at Baudette MN / Rainy River ON; only 75 miles from International Falls MN / Fort Frances ON. Secluded but not Isolated – close to shopping, hospitals etc. on USA & Canadian Sides of the Border. Excellent CABINS - 2 & 3 Bedroom Lakeview, Clean, Modern, Comfortable, 3-piece & 4-piece bathrooms, Air Conditioning, HD Satellite TV, DVD Players, Radios with CD Players, LP Grill, Range with Oven, Fridge with Freezer, Alarm Clocks, Linens/Towels/Bedding, Microwave, Crock Pots, Coffee Maker, Toaster, Pots, Pans, Dishes, Fire pit, Picnic Table etc. Deluxe 3 Bedroom Cabins have all the above amenities WITH 2 Bathrooms, 2 full sized Fridge/Freezers, 2 Air Conditioners, 2 HD Satellite TVs in each one. Deluxe BOATS - Deluxe 18’, 50hp electric start 4-stroke motors, GPS/Depth finders, electric Trolling Motors, Livewells. UPGRADE: 18’-19’ Boats with Steering Wheel & 75hp or 115hp 4-Stroke Motors. OR Bring Your Own Boats. Electricity at the Boat Slips. Experienced Fishing GUIDES with 19.5’ Guide Boat – Book by the 8 hour day - Add the Canadian Shore Lunch experience as well! LOW PRESSURE Fishing & Hunting - Low Populated Area; No other Resorts for 20 Miles. Variable Night STAY - 3-7 Night Cabin stays for Fishing & Family Vacations; Choose which day of the Week you Arrive & Depart. Check in 2-9pm; Check out by 9am - other times may be arranged. RV Sites - Monthly or Seasonal stays. Full hook-up with Sewer, Water, Electricity, Boat Launch, Boat Docking, Fish Cleaning Facility, Fire Pits. MEAL PLANS - American Plan “All Meals”, Modified AP “Dinners”, No Meals (cook for yourselves in your complete House Keeping Cabins). Meals are served in the Lodge - Family Style or Buffet Style, depending on size of groups being served. SCENERY - 302 Bird Species, Wildlife, Sunsets, Berry Picking, Beaches & Walking Trails nearby. Competitive RATES – Great Value for your Money. You won’t be disappointed! FISH – 7 Species! Walleye, Musky (Muskie), Northern Pike, Smallmouth Bass, Crappie, Perch, Sauger. An abundance in the number and trophy sizes of each Fish species found here. Master Angler Awards - Free Certificates available. Please explore our website and contact us if you have any questions or would like to book your vacation. We will strive to make your vacation comfortable, exciting and provide you with great memories that will last a lifetime. Come visit us for the best Ontario Walleye Fishing! 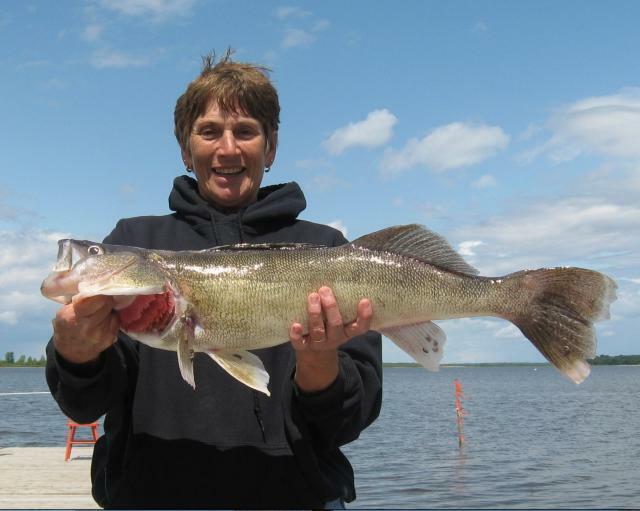 Walleyeare plentiful, from good eating sizes right up to trophies over 30 inches. We are just a short distance from major Walleye spawning areas too. The population of Walleye stays high in our area all year, which makes this area very popular for Ontario Fishing. Along the shore and around the rocks and reefs are countless Smallmouth Bass that are common in the 2 to 4 pound range. Our guests catch alot of Smallmouth Bass that are 5 pounds and over with a few 6-pound Smallmouth Bass being caught occasionally. 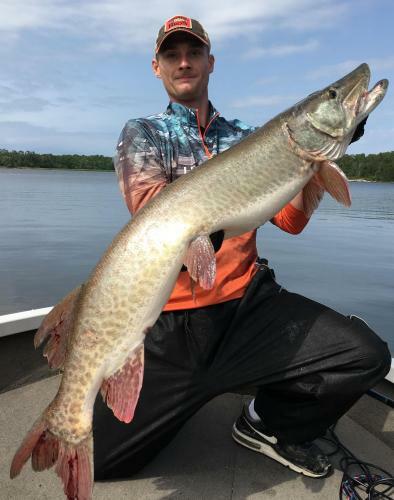 Walleye, Smallmouth Bass, Musky (Muskie), Crappie and Northern Pike are our biggest fishing attractions here, although Lake of the Woods also produces excellent fishing for Sauger and Perch. Our guides can show you all the fishing hot spots! Walleye are the most popular game fish though,as their mild fillets are prized for shore lunches. 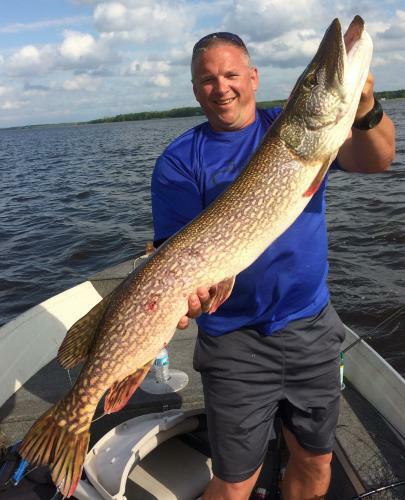 Northern Pikeare common in the 5 to 10 pound range but Lake of the Woods does produce Northern Pike up to 30-pounds and more. They enjoy the weed beds along the extensive shoreline. Lake of the Wood’s true fame comes from the presence of Monster-Size Musky. Muskies over 50 inches are not uncommon and every year Muskie in the 50-pound range are caught & released. Lake of the Woods could easily be the lake that produces the next World Record. 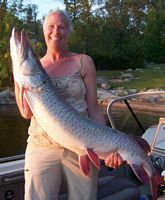 50-55" Muskie are often caught from our resort. Our region has outstanding trophy hunting for trophy Ontario Whitetail Deer, Black Bear, Waterfowl and Gamebirds like Grouse. 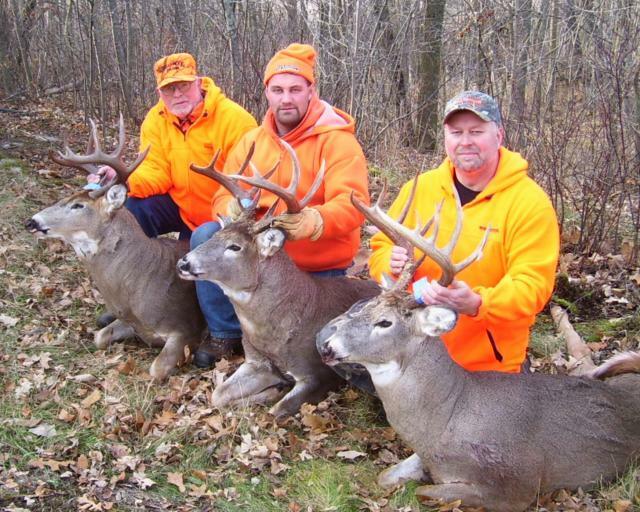 The Rainy River District is an area with the best Whitetail Deer hunting in the world. This is the last place where fair-chase hunts for huge trophy Whitetails is available. Our Ontario Whitetail Deer are big with huge racks. Every year Whitetails are harvested in the area that score between 180 - 200 Boone & Crockett. Come join us for some great Ontario Deer Hunting. Black Bear in our area can get huge and are found in color variations such as Brown Bears and Cinnamon Bears or Blonde Bears. Our vast Black Bear management area has produced Black Bears over 700 pounds, which is just unimaginable as farther north the land cannot produce enough food for a bear to get that big. We are located at the thinnest point of the Mississippi Flyway. As a result, Waterfowl are more concentrated here. Millions of Ducks and Geese have staged around our lodge before continuing their long journeywhile migrating south. Duck and Goose hunters can expect some great hunting. Game trails, logging roads & other low use backwoods roads give hunters access to the surrounding forest where Ruffed Grouse and Spruce Grouse and Woodcock are very common. Please also view Cabin section for Cabin Interiors & to see New Cabin 7. We will customize your vacation packages to suit your needs as best we can. Come stay in one of our lakeview Cabins where you can plan an all inclusive family holiday that includes your American Plan Meals, or choose one of our Housekeeping vacation packages. Fish, Hunt, Relax, go sightseeing, or rent a boat as part of your holiday adventure. Don't want to lose touch with the world - we have Cell Phone Access, Satellite TV and Wireless Internet Capabilities here. You have another choice for your family vacation adventures in Canada - staying in our lakeside RV and Camper and Tenting Campgrounds, where you can enjoy the "comforts of home" in your own RV or camper. We offer great activities for your children. There is a children's playground that has a trampoline, wood fort with swings and climbing ladder and slide. There are also games that young and old can play like badminton, bocce ball, croquet, horsehoes and ring toss. The family will also enjoy swimming on the nearby private sand beaches, tubing, waterskiing and exploring the sand islands for "sea shells" and driftwood among the treasures you'll find. You might also be interested in a day trip for an ecotourism adventure of sightseeing, boating, touring the lake, birding, nature and wildlife viewing or interpreting the many different plants, trees and flowers in this very distinct area. Pets are welcome. Although we realize that your pet is part of your family, certain "pet rules" apply. Please see our cabin section for complete information. This area is renowned for ecotourism activities such as Bird Watching as there are 302 recorded birds in the area. Windy Point, (Rainy River Ontario), is known for being the nesting grounds of the nearly extinct Piping Plovers. Also found here are the rare Red-headed Woodpeckers, Red Bellied Woodpeckers, Orchard Orioles, Eastern Magpies, Bald Eagles and Yellow Rails etc. We have an influx of birds from each of the northern, southern, eastern and western regions. These bird species from all the regions of North America make this a very unique area and especially great for your eco-tourism bird watching vacations. For your Ontario Fishing Vacations or Family Vacations, we rent deluxe 18' boats and canoes too. Our Deluxe 18' Boats have "environmentally friendly" 4-stroke motors. Enjoy fishing and lake tours as well as outdoor adventures such as tubing or water skiing. You can rent a house keeping cabin and use our boat launch and docking for your own boat. Not staying with us ... buy your bait here and launch or dock your boat for a nominal fee. You may also try some Guided Ontario fishing by hiring an experienced fishing guide service and do some freshwater Canada fishing as well as getting a lake tour at the same time. We can customize your fishing vacation, and add shore lunches as well. Come Experience Ontario Walleye Fishing and Canadian Shore Lunches! Here's a view of one of our Shore Lunch Spots and our Deluxe 18' Fishing Boats. This is a beautiful View of Lake of the Woods in a relaxing atmosphere, accompanied by your experienced fishing guide. You can choose the fishing vacation or guided fishing vacation you would like. 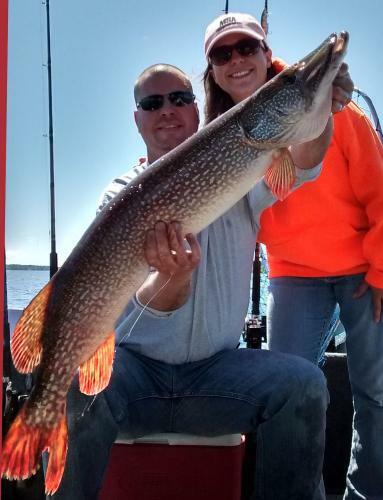 Being on Lake of the Woods and close to the Rainy River, we can offer excellent freshwater fishing vacations. Anglers can enjoy sport fishing for Walleye, Northern Pike, Smallmouth Bass, Sauger, Perch, Crappie, Muskie. Please view each fishing section of our website for the species you are interested in, as well as our guided fishing vacation section. Come experience great Ontario fishing and fun family vacations. Guests of Harris Hill Resort can receive a 10% discount off the Green Fees at Spruce Creek Golf Course, only 16 miles away. View our Activities Sections - for other "Things to See & Do"
Harris Hill Resort Outfitters offer exceptional Ontario hunting vacation packages. 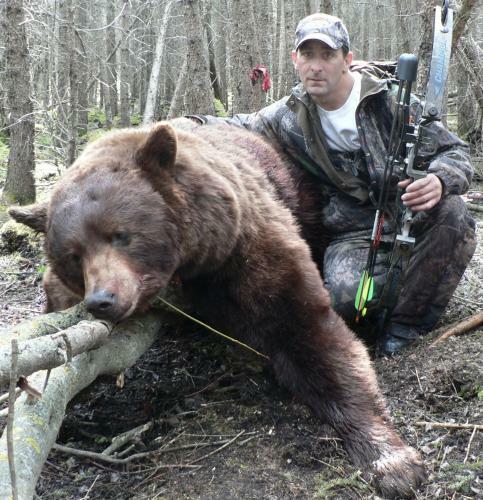 Hunts for big game in Canada are popular here. 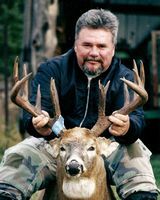 We offer "big Game" hunts, including Ontario Whitetail Deer Hunts, Black Bear hunts and also Duck Hunts & Goose hunts. Although we do not offer separate packages, Grouse are often hunted here as well in the fall. Combine a Fishing and Hunting Vacation at the same time. At Harris Hill Resort, we recycle and also offer Recycling to our guests. We use "green - earth friendly" cleaning & laundry products. Whether it's a fishing vacation, a hunting vacation, a family vacation or an ecotourism holiday, you'll be pleased with our services, our accommodations and our quality vacation packages all at affordable prices. Also a great place for a lake tour, nature tour, wildlife viewing or a bird watching vacation with your family or by yourselves. Please visit each individual section on this web site for more detailed information on each category of activity or service that you are interested in. Ontario Fishing, Ontario Hunting, Family Vacations, Bird Watching Vacations - WE have it all! or e-mail us through our "contact us" section of this web site. At Harris Hill Resort we offer quality services, great hospitality, affordable rates, comfortable accommodations and a relaxing atmosphere.